Bridge hand placement has a big impact on your timing. 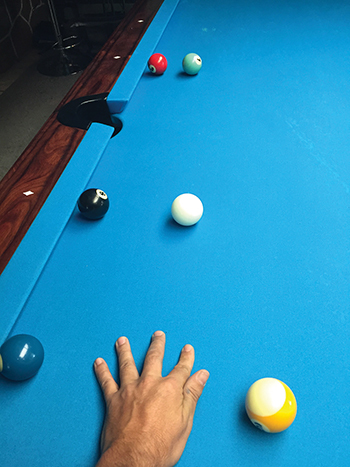 Timing is so critical to hitting the cue ball with consistency, and it is really very easy to be off on your timing. In golf, if a player is not lined up properly, his timing isn�t going to be right. He�s going to come around the ball or under the ball and he�s going to spray the ball around the course. The same is true in pool. I recently played in the World 9-Ball Championships in Qatar, and I didn�t play particularly well. I wasn�t getting through the cue ball well. I didn�t play again for several weeks after that tournament, and I spent some time thinking about what I was doing wrong. When I got back to the table, I went back to basics. I immediately began with the drill I�ve discussed before: shooting straight shots and drawing the cue ball straight back to the top rail. I didn�t want to just throw balls out on the table and practice. That tends to make bad habits worse. Additionally, I checked where my hand is positioned on the shot. I do this by placing balls at the diamonds along the long rail. I use the diamonds as a guide for where my bridge hand should be. When my timing is right and I�m playing well, my bridge hand is approximately one diamond from the cue ball. To check this, I place the cue ball in line with one diamond and physically place my bridge hand directly on the rail a diamond behind that. Then I move my hand straight over to the table. This way I know my bridge hand is where it should be. The hand placement is important. 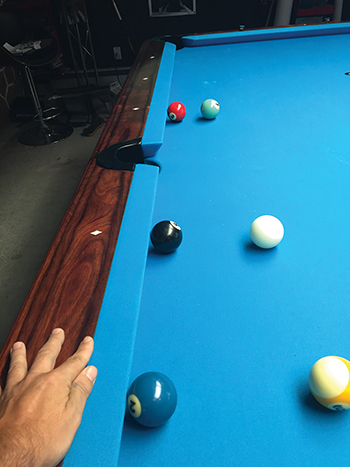 If your bridge hand is too far from the cue ball, you won�t be able to really stroke through the ball. Also, the added distance between your bridge hand and the cue ball makes it more likely that your contact point on the cue ball won�t be precise. You�re likely to add spin that you didn�t intend to add. If your bridge hand is too close to the cue ball, you will find yourself stabbing at the ball and the cue will fall off your bridge hand when you draw the cue back. This is a common problem with amateur players. They tend to want to get too close to the cue ball and they don�t get the loose, fluid stroke they need to execute shots like this. Your bridge hand position shouldn�t really change much, but occasionally we all get a little lazy and our game suffers. Most of the time, your hand will know where to go. Of course, the placement of the bridge hand is going to vary a little from player to player. Someone taller or with a long, winding stroke is probably going to have his hand a bit further from the cue ball. Players like Shane Van Boening and Earl Strickland have opted for extensions on their cue so they can bridge farther back and still get through the ball properly. This is a simple routine, but it really works. I started out with this drill, and my timing is much better already. Diamonds along the rail serve as a guide to determine how far your bridge hand should be from the ball.